Italy’s best kept secret. Isola di Ponza. Island of my dreams. When people ask me what my favourite destination was in all my seven months of traveling Europe, my answer is unequivocally Ponza. I’m constantly torn between the desire to keep it secret and bubbling on about it to everyone I meet. 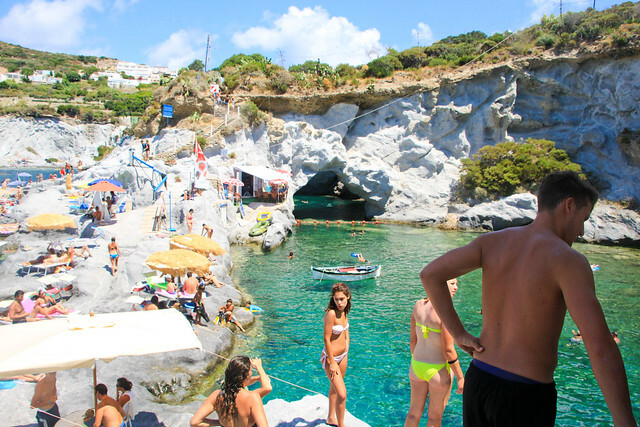 Ponza was just one of those places, you know? Where everything just went right. It was literally the perfect holiday. 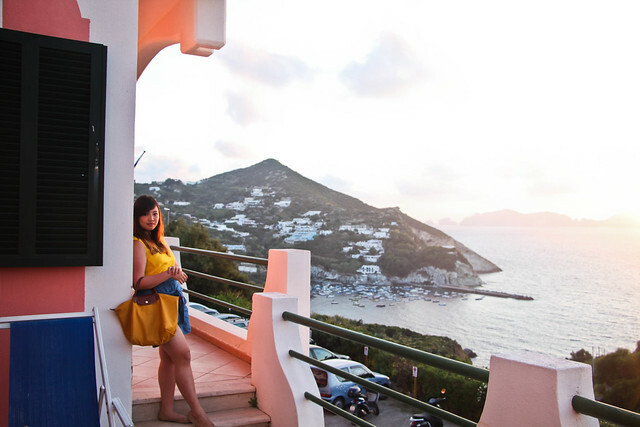 I fell in love and wanted to go back over, and over, and over again..
We discovered Ponza quite by accident, the way most beautiful things happen. 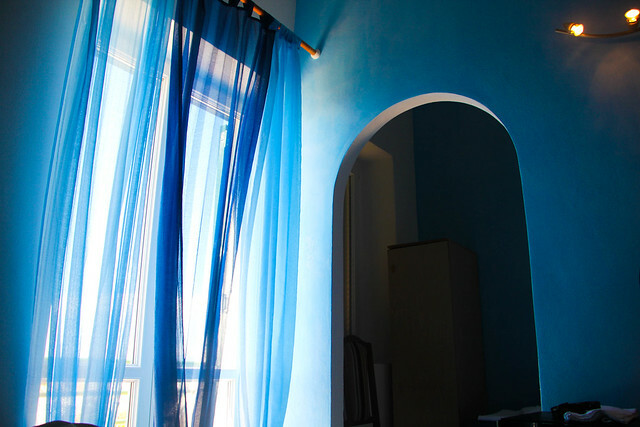 I believe we were lounging indoors one afternoon in Prague, roundly defeated by the heat, refusing to leave the room. I was nagging at the boyfriend to bring me to Greece. Santorini! Everyone has been except me! He was poking around at google maps for fun. If we’re going to go to Santorini, we have to book our tickets now, I said. Wait a minute, he replied, look at this..
That was how we discovered Ponza, the boyfriend zooming in on a funny shaped little blob off the coast of Italy. 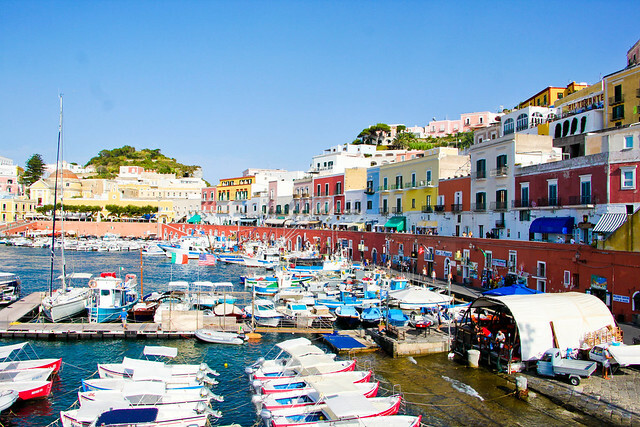 Neither of us had heard of Ponza prior to this: we pulled up a picture of it on Google and were instantly mesmerised. Santori-what? Thus began the long and hard journey to Ponza. It was long and hard because when I say it’s Italy’s best kept secret, i do mean it’s Italy’s best kept secret. Nobody knows how to get there except Italians. Firstly, it seemed nearly impossible to find the place. 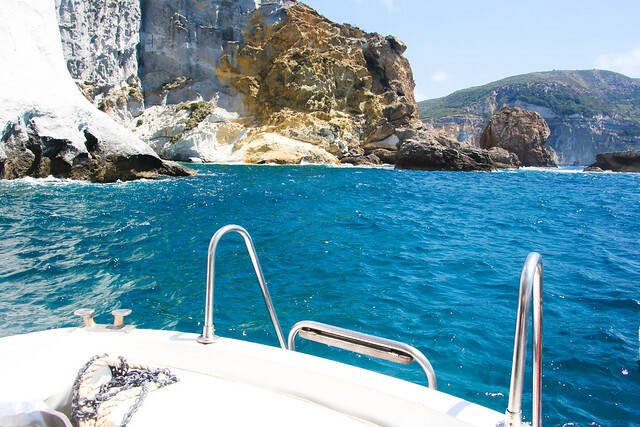 It took us awhile to figure out that getting to Ponza really meant booking a boat to the Pontine Islands. We tried booking the boat from Naples through their national website, but couldn’t seem to click through. We emailed the site owners several times to be quite pointedly ignored. We were all but about to give up on our Ponzian dreams when I ran into an Italian girl, trying to buy a cup of freshly squeezed orange juice from a street vendor in one of the back alleys in Istanbul, Turkey. 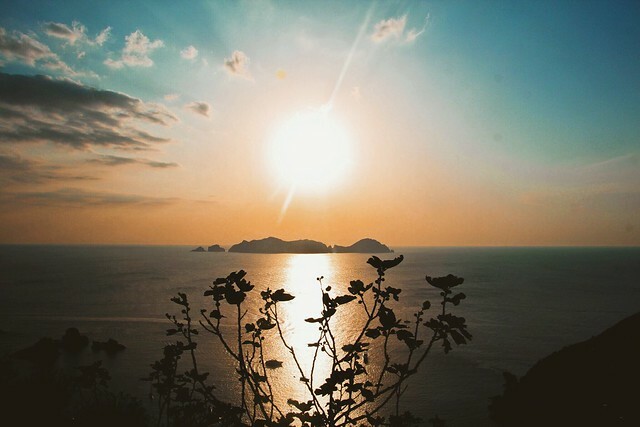 We struck up conversation and I mentioned Ponza – and her eyes lit up. Ponza! I love that place! 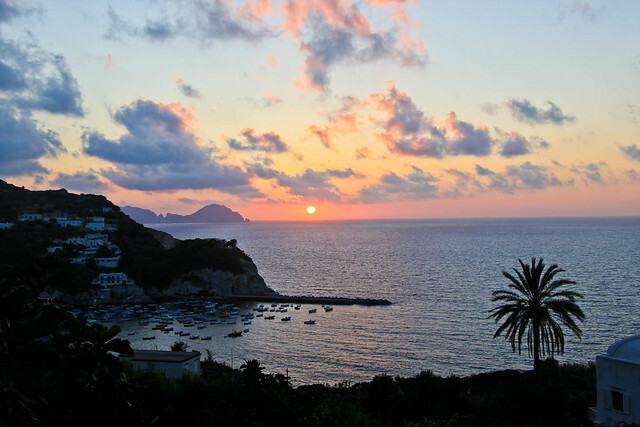 She shrugged: that’s Ponza for you. Look, she said, scribbling her email down on a scrap of paper, I have to go, but text me. I’ll tell you how to get there. And she was gone. I looked down at the scrap: her name was Cecilia. 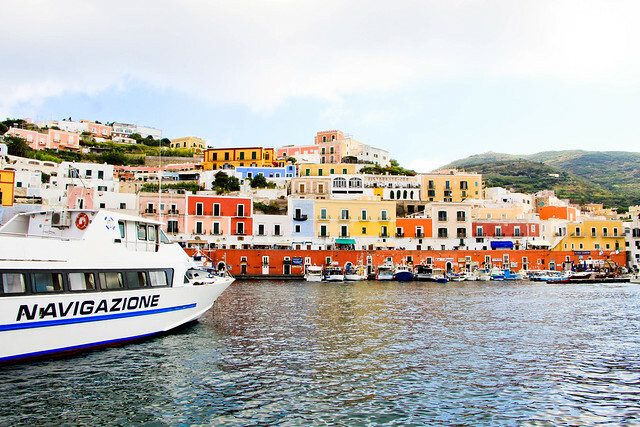 You can get to Ponza via ferry or hydrofoil. The main difference is that the hydrofoil is two times as expensive but takes half the amount of time to get there. The website that worked for us in the end was http://www.ok-ferry.com. It looks extremely dodgy and we were pretty afraid right up till the point where we got on the ferry itself. It will get you there – don’t worry. 1. 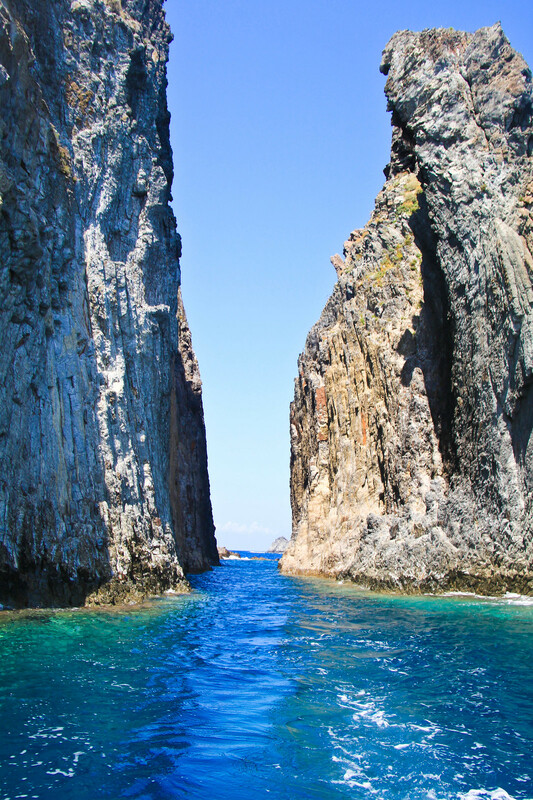 Under routes from/to, select Pontine Islands. I took the Formia-Ponza route. Technically, most people go from Rome – Anzio and Terracina are the ports outside of Rome, you take a train there and then board a ferry. I was coming up from Naples (pompeii!!) so I ended up in Formia, less than an hour’s ride from Naples. It’s up to you. The ferries that don’t accommodate cars are lighter and go faster. The ones that accommodate cars are slower and about 10EUR cheaper. Pick whichever suits your budget/ timings. It should cost you about 50EUR total, max, if you’re taking the fast ones, and there is also a booking fee of 12EUR. Even though you’ve made payment, this booking confirmation is not a ticket. You’ll still need to collect it from the ticket man at the dock, then present it to board. The ferry should be this giant one under the company Laziomar, you’ll know it when you see it. 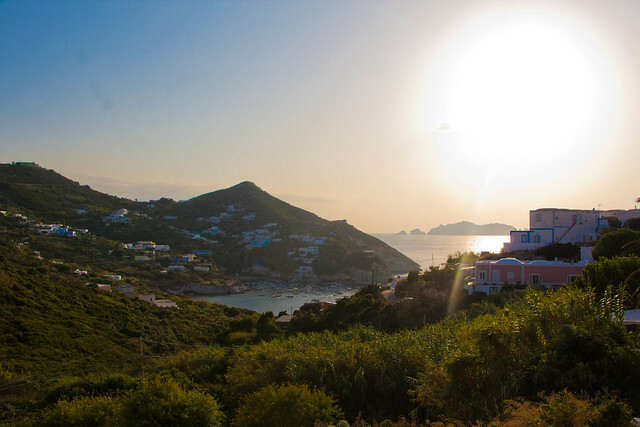 Ponza is basically a tiny, beautiful, Santorini. It is also a long, scythe shaped island. On one end you have the harbour and docks, on the other you have the beaches and most of the accommodation. It’s so small that there’s only one bus that goes back and forth the two ends of the island, which will cost you just one euro each time, if I remember right. You also have the option of taking this slow leisurely disney-esqe choo choo train, a great way to take in the sights from one end to the other, but I only saw it once in my entire time there so in my head I’ve started referring to it as the magic train. Alternative options include taking a cab or renting a scooter, both of which I didn’t try. We booked our accommodation through him (his name was Enzo) and crossed our fingers hoping desperately he wasn’t a fraud. He said we could just pay him and he’d arrange for us to stay in his friend’s hotel, and the disappeared on us for awhile. 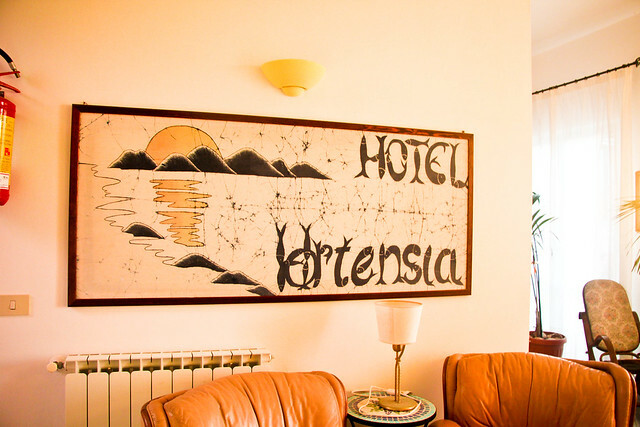 We got a little worried – and then he returned to say here, turn up at Hotel Ortensia when you reach. They know you’re coming. It was the best thing that could have happened to us. The people at Ortensia were amazing. 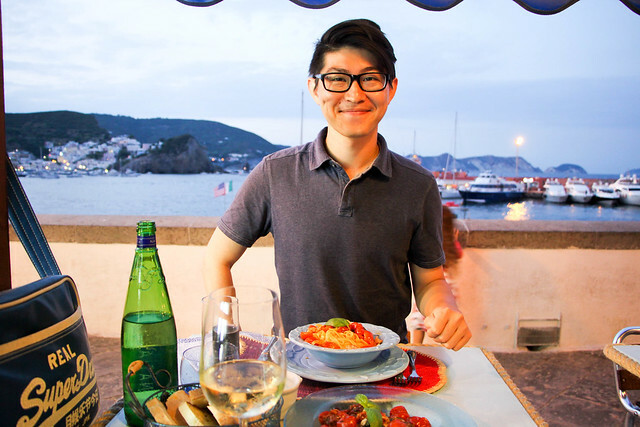 I could have sworn we were the first Asians they’d ever seen – sure enough, we didn’t see a single other Asian on Ponza when we were there – and they blinked hard at us. How did you hear of us? They demanded. 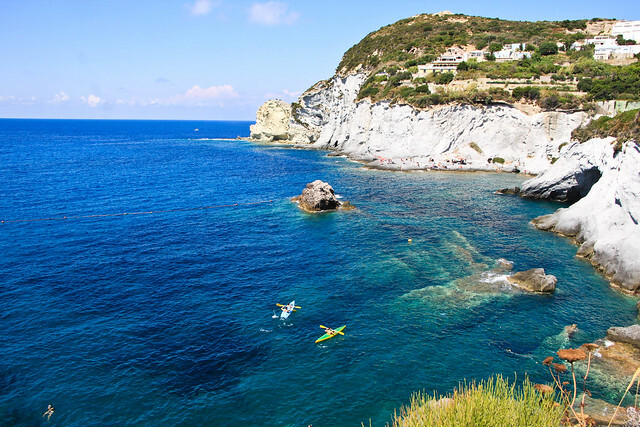 How did you know of Ponza? Can you bring all your friends? And then they upgraded us to the best room in the house. I’m talking top floor, sea view business. It was insane. It was completely unnecessary. It was so kind. They even threw in a free breakfast for us each morning, which wasn’t what we’d paid for. We’d paid for some airbnb room somewhere, not the works, yknw? It was just incredibly kind. Already Ponza was exceeding expectations, right from day one. 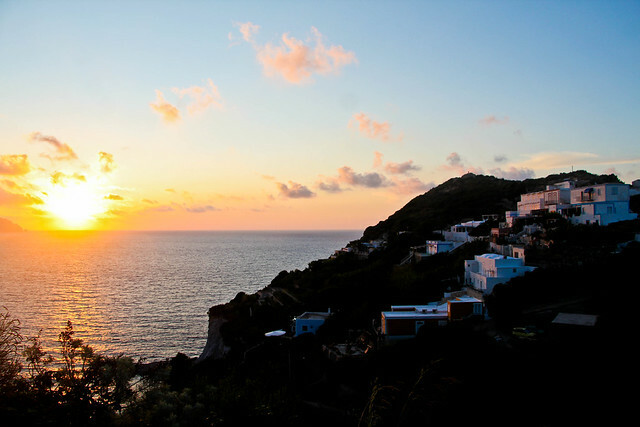 The beauty of Ponza is, it isn’t a tourist destination. The main holiday makers here are Italians escaping from Rome for a weekend, and the occasional non-Italian European. We saw about two Americans the entire time we were there, and apparently Lionel Messi was there as well – but off the coast, in his private boat. Obviously. The rest of Ponza consists barefooted little children running around playing, tanned Italians selling overpriced crafts and homeware, and leathery fishermen. 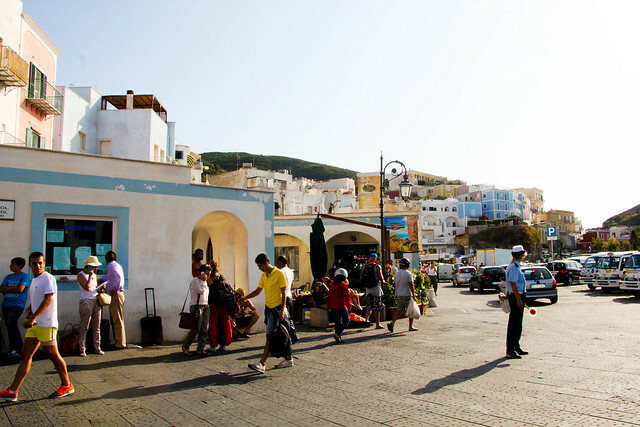 There is no shopping to be done on Ponza, obviously, and only a smattering of hotels scattered along the island as if by afterthought, to accommodate the accidental tourist. It is anything but commercialised. In fact, it’s so technologically oblivious that their national site hasn’t been updated in three years. That said though, the best thing to do on Ponza is essentially to take a step back and relax. 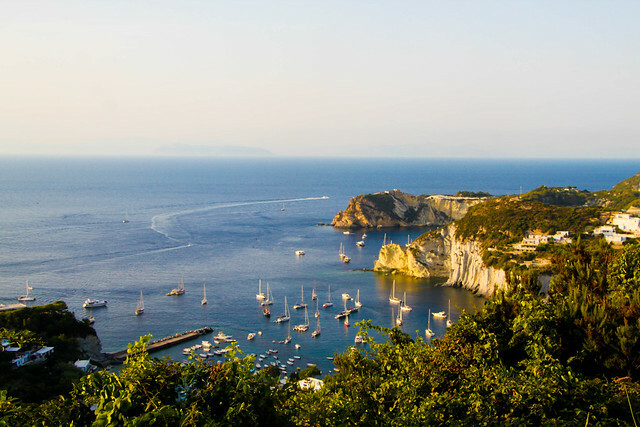 How this differs from other destinations: relaxing on Ponza is a whole new ball game. 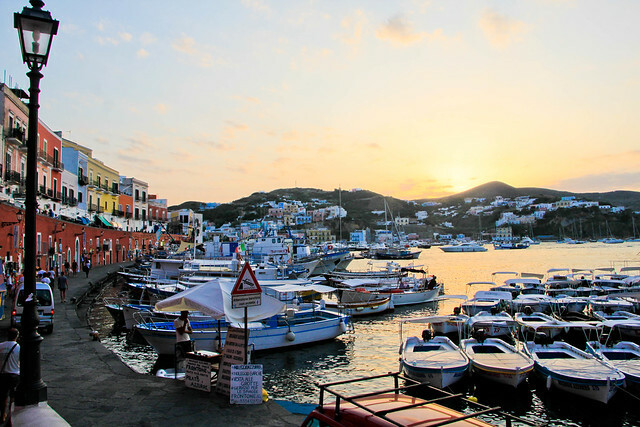 There aren’t that many restaurants on Ponza, and most of them are concentrated along the dock. If you’ve been following me for awhile, you’ll already know that I use foursquare a lot to decide where around me is good for dining, attractions, getting to the toilet, etc. (Re: Top Five Free Travel Apps) But because comparatively, so few tourists end up in Ponza, there aren’t that many places that actually end up listed or even reviewed. 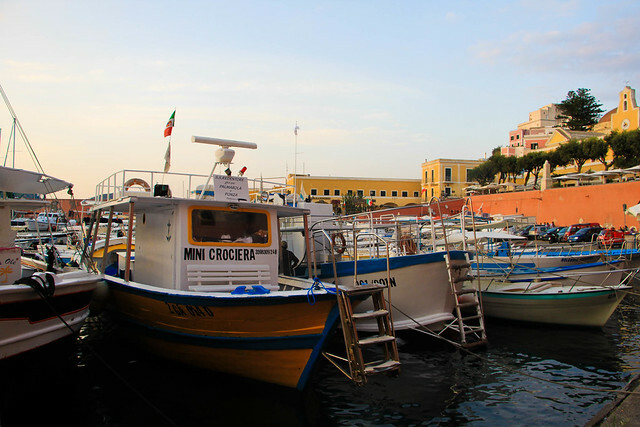 We ended up our first night in this cute little restaurant along the dock called Osteria By Ponza Fish. 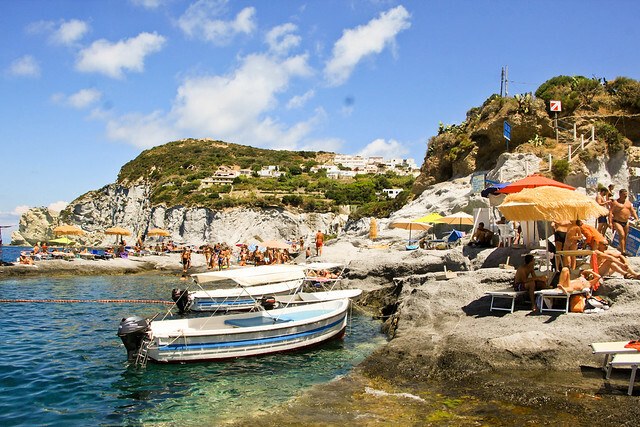 It’s important to remember that being a fishing village, nearly all the seafood you have on Ponza will be impeccably fresh. By that rule it is generally safe to walk into any restaurant.. though not having tried every single one, obviously, I wouldn’t be the best judge. I remember feeling like Osteria was a little overpriced although the food was good, so walk on and find any one you like the ambience of. So dinner and sunset by the dock – is a given. After dinner, walk along the harbour and trail the little winding shophouses. You don’t have to buy anything, but it’s just incredibly relaxing. A shop will inevitably be playing some form of music, and there’s a lot of open laughter and banter in rapid Italian you won’t be able to understand. 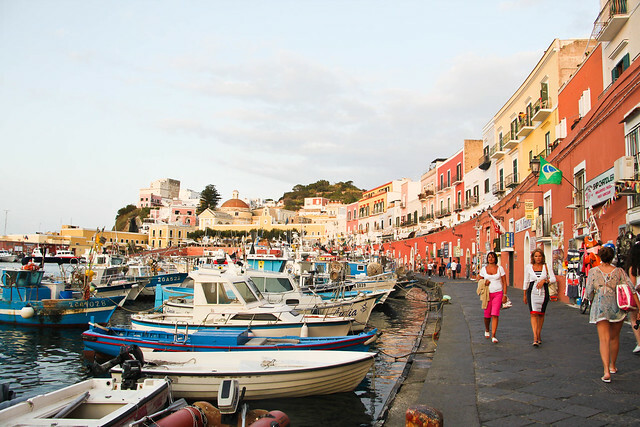 You’ll feel like a fly on the wall, given an intimate glance into life in Ponza. People won’t make way for you. It’s a nice feeling, after being fawned on all over Italy for being Asian. Outside of the little shophouses though, things get different. 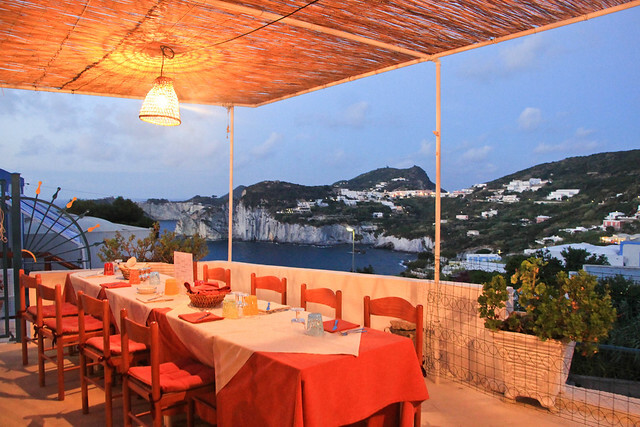 We had our dock dinner already, and we wanted to go all out for another dinner on a different night, so we tripadvisor-ed the best restaurant in Ponza and ended up on the other end of Ponza, on the higher side nearer to our hotel, at Il Pescatore. There are times you want to blend in, there are others you don’t. 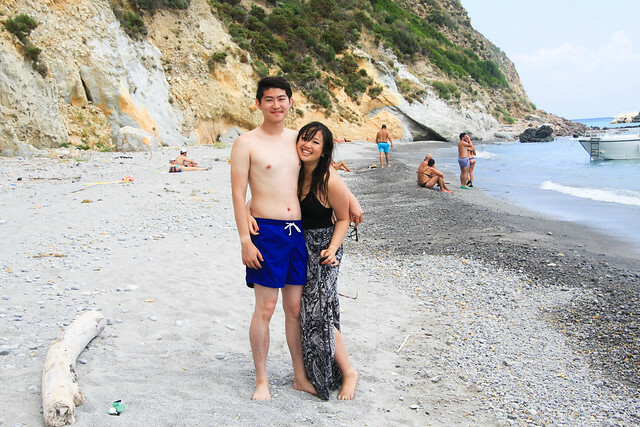 I have to say – being possibly the first Asians they’d seen was a huge advantage when getting around Italy. Il Pescatore is rated Ponza’s best restaurant on Tripadvisor, and they were fully booked when we sauntered in unassumingly. They shook their heads at first, then looked us up and down again, and went: You know what? Come in. We’ll make it happen. And then they made a table appear out of nowhere for us. I kid you not. The staff started unfolding and setting up this tiny table and within minutes they’d produced an entirely furnished dinner table for two. I must have been gaping a tad too obviously, because one of them winked at us. We just want you to have beautiful memories. Lets not even talk about the fact that the view was, obviously, gorgeous. Watching the sun set over the white cliffs.. Lets focus on the food. Everything was incredibly fresh, and surprisingly reasonably priced for Ponza’s top restaurant. I believe we paid only slightly more than what we did at Osteria. 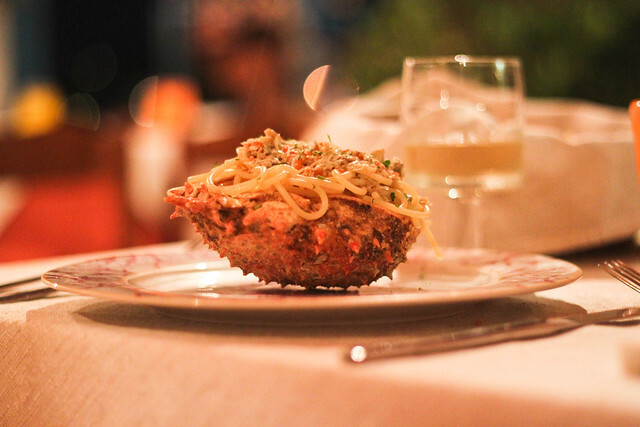 What they do at Il Pescatore is pair a type of homemade pasta with its complementary seafood dish, and then suggest the wine pairings to go with it. 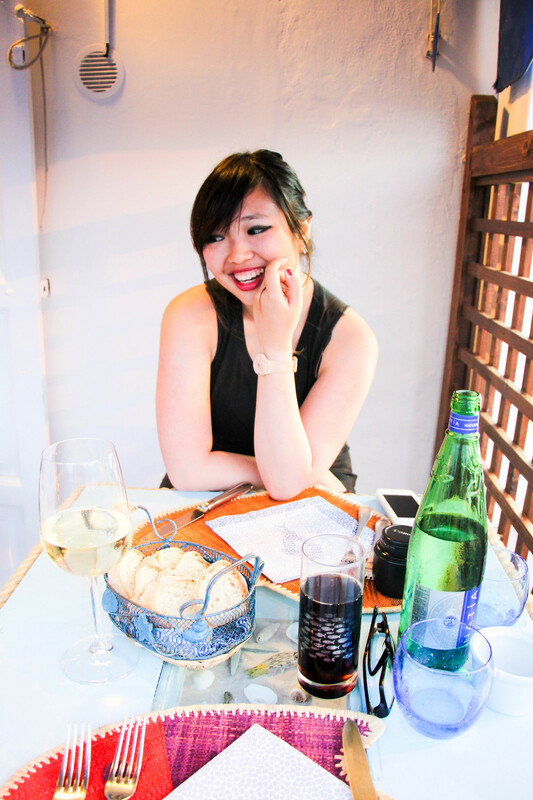 White wine became a very big part of my life *ahem* in Italy, and the one they served at Il Pescatore was delicious!! They actually grew and produced it themselves behind the restaurant. It was lovely. Are you from Tokyo? It’s just, you know, I watch Fast and Furious. And the face is the same. In hindsight I think we laughed a little too much. 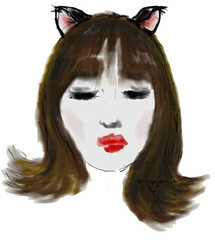 His face turned bright red and he mumbled something in Italian embarrassingly, which I believe translated to fml. After that, every time he passed our table he’d laugh a little in this self conscious way. He was also extremely handsome. I don’t know why I put that in, but he was. After dinner, the chef came out with a bottle of homemade Limoncello. Limoncello is an Italian lemon liqueur mainly produced in Southern Italy, and when he produced it after we’d finished with our meal we looked at him blankly: we didn’t order this. He smiled that broad italian smile and put it down on the table. With compliments, he said. Shane and I exchanged an amazed look. What was this sorcery? We concluded that we loved Italy, and Italians. We really do. On the way back from the restaurant to the hotel, we ended up heading to the sundeck on the hotel’s rooftop and catching the first meteor shower of the season. I lay there stupid happy, satisfied, watching the stars fall while listening to Shane point out the various constellations and explain their mythology to me. It was such an incredible night. 2. Take a boat out for a day. This is unquestionably the best decision we made in Ponza. Once again – only something we would have known if we had known a local, which we kind of did because everyone was so friendly. Remember Enzo, the airbnb guy who didn’t have any space for us? He sent us the contact of one of his friends, who does daily boat rides from about 10am to 4pm. It was about 25 Euros per person, to island hop, lunch included. I remember we shrugged and just went for it because we didn’t know what else to do on Ponza anyway. Best. Decision. Ever. We never learnt his name – he spoke no English, and we spoke no Italian. Come to think of it, no one on that boat spoke much English. He did press a flyer into my hands though, with motobarca beluga printed in large, bold, type, and you can get him at 349.4742538 – 0771.808557 which I presume is a sort of telephone number. Ask anyone on the island, and they’ll direct you to him! He picked us up from our hotel in a minivan and drove down to a tiny bay nearby, where his yacht was docked. From there on, it was an entire afternoon of sailing from place to place, stopping at random beautiful areas to snorkel and swim with the fishes while he played romantic classical Italian music from the boat and sung along. 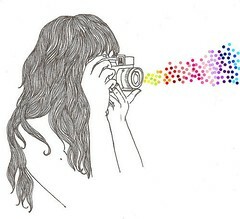 Picture this, okay? The clearest of waters. Floating on your back, being serenaded by an Italian tenor, voice drifting from the yacht. Losing track of time. It was perfection. 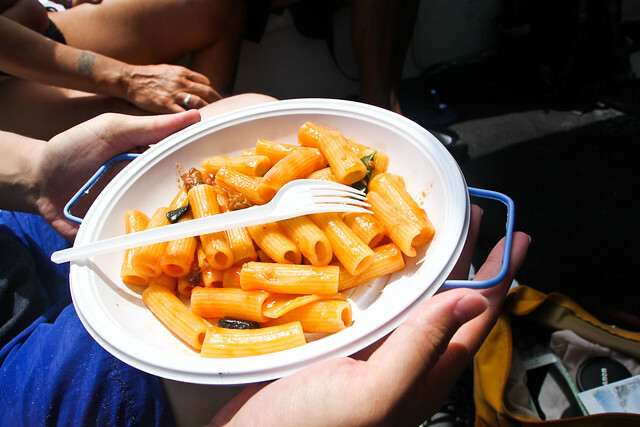 We swam up to the boat after a good hour of swimming and snorkelling, and Italian Man had whipped up a meal of pasta and white wine while we were gone. Remember what I said of white wine being a big part of my life when in Italy? This is what I’m talking about.. It was so crazy delicious even though it was so simple. We also docked at a couple of islands that might as well be private islands, for all the quiet and seclusion we enjoyed. I had a good time pretending that it was basically a private beach just for us. We basically explored the island then flopped on the sand, intermittently napping and suntanning. I came back from Italy very, very brown. Beyond that, he also sailed to several spots where the water had significantly different shades of blue, just so we could go for dips and take photos. This particular island had turquoise water.. It was the perfect afternoon. I foresee myself using the term perfect way too many times in this post, but it is what it is. I can’t believe it only cost us 25 Euros – that would have been the price of a good lunch in Europe, alone. EDIT/ An Italian reader added: his website is http://www.ponzagitainbarca.it, for anyone interested! Thanks Gisella! 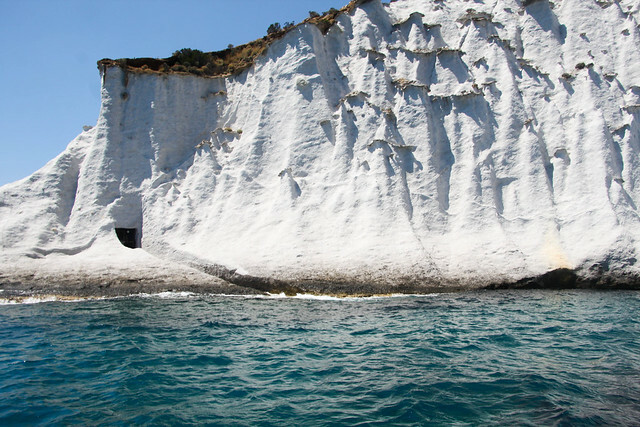 Piscine Naturali stands for natural pools, and these were formed by the intense volcanic activity on Ponza long ago. 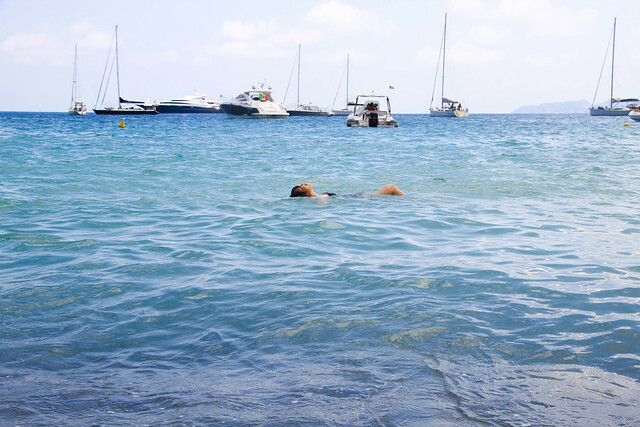 Water in Ponza is amazing – it is quite literally crystal clear at any point, any beach, any pool, but the Piscine Naturali (5 minutes walk from our hotel) was a league of its on. 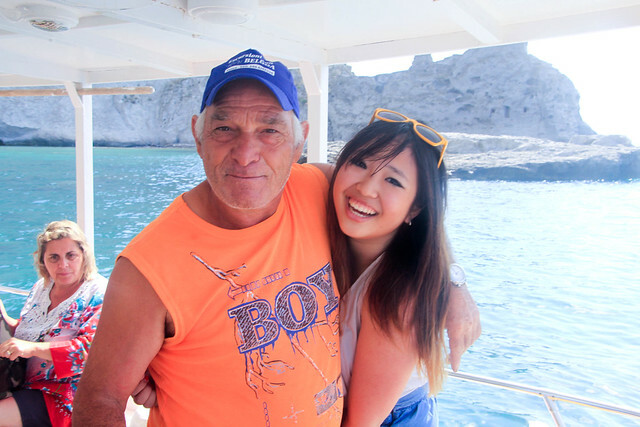 People on Ponza are incredibly friendly. 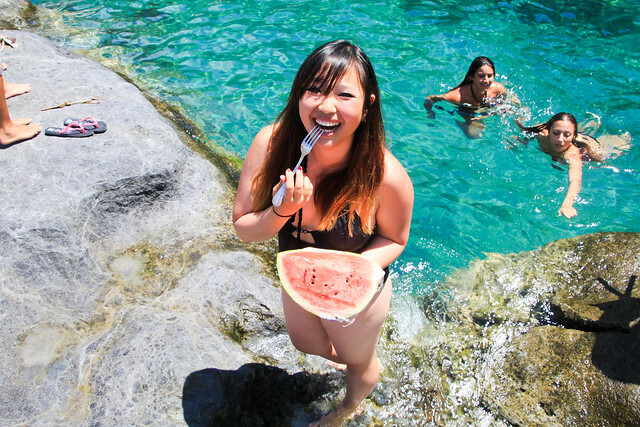 We went relatively unprepared – no snorkelling equipment, just us, a couple of beach towels, and a watermelon. Once we reached, however, it became apparent that we were missing out. 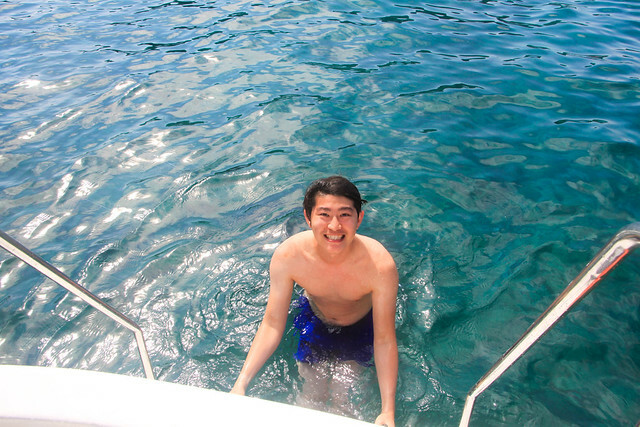 The place was teeming with fish, coral, and other types of beautiful marine life. People were diving bottoms up just to get a glimpse, and we didn’t even have basic goggles. I ended up trading a polaroid picture for a snorkelling equipment loan from this guy who worked at the shop – it seemed noone had seen an instax camera before either, all over Europe when traveling people stared at my instax whenever I took it out in wonder, some even coming up to me to comment: Cool camera. I was just generally very impressed that this random dude agreed to lend us his snorkelling equipment for free when you could buy it right there, from him, for some marked up price. Just bring it back in one piece, okay? Okay. The natural caves were incredible. Everything – everything was incredible. 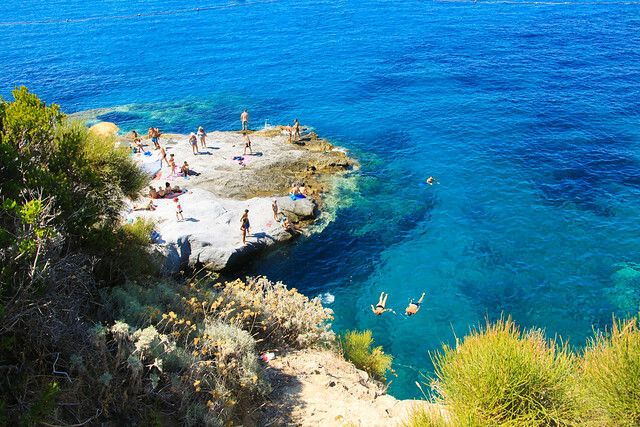 I had the best swim of my life there, in cold, clear waters, cannonballing off the edge of a decidedly shorter cliff than the one in Cinque Terre. I remember precisely this one point where I came up from a dive in this white cave, alone in this giant cavern with incredible water sparkling off the walls, fish swimming around me unperturbed by my presence, and thinking this is what I want the rest of my life to be like. I have a penchant for exaggeration, all writers do, but I do believe I meant it. 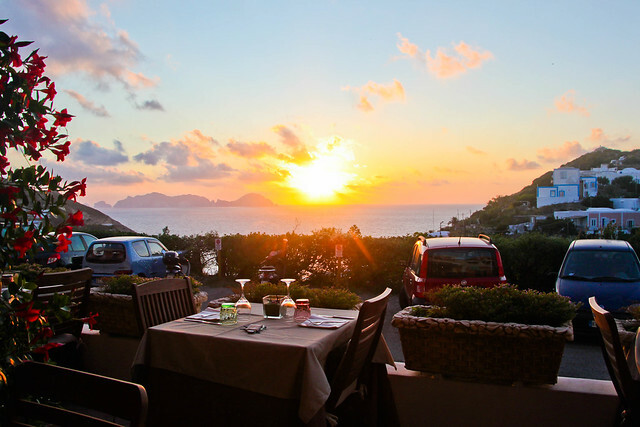 The sunset view from the dinner restaurant in Hotel Ortensia. 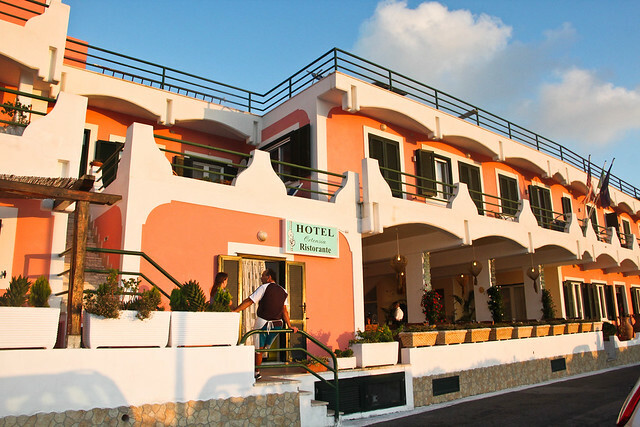 On our last day in Ponza, we packed up, went for our last swim, and came back to the hotel to dry off and clean up. Our boat out was only 4pm, so we actually had quite a bit of time, and since we’d checked out that morning we had no access to our room to shower. No issue – the hotel’s staff let us into this other shower they had on standby for hapless guests like us, which was extremely sweet of them. We headed down to the bus stop outside the hotel with all our luggages, clean, happy, waiting to take the bus back to the harbour. The bus came and went. 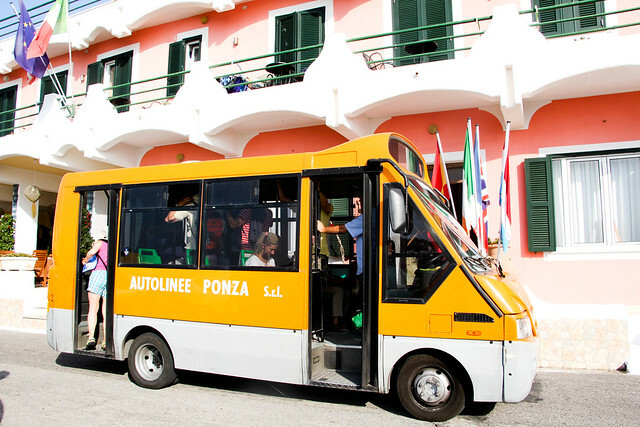 I think this was our first real moment of panic in Ponza, that the buses were so incredibly full that none of them would stop for us. We went back to the hotel after the buffer time we gave ourselves to get to the dock was fast running out, asking the desk staff if they could call a cab for us. They heaved out this phone book with the number of every single cabbie on the island and started calling them one by one. This alone was incredibly sweet of them, going to all that trouble. And then the lady snapped the book shut and shook her head. No one is free. We will drive you. Get in the car. The hotel owner’s husband started up their family car, loaded our bags in, and drove us all the way down to the harbour, then refused to accept a cent from us. We just want you to have had a good stay in Ponza he explained, shaking off our offers of payment. Now hurry – or you’ll miss your boat. And we left Ponza thus, overwhelmed, with our heads turned back towards the slowly disappearing shore. 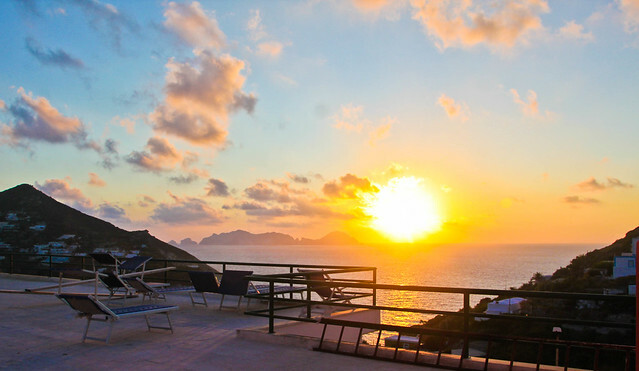 Could Ponza have been any more perfect? I don’t think so. It was just one of those holidays where everything seemed to have gone right, where people were unreasonably kind, where the place itself was straight up stunning. The boyfriend and I have already made a pact to return every five years – and it is pretty much hands down my favourite destination in all of Europe. It took me so long to write this post because I wanted to get it right, I didn’t want to have to rush through it, but even now I don’t think I do it justice. It was just the most breathtaking gem. Jem, I’m so happy you had a lovely experience in Italy. Being Italian, I know we’re not the best when it comes to treating tourist (it’s a sad truth) but it seems that not all hope is lost! Thanks for penning down this post!! I enjoyed every single word of it and felt like I was there myself! And everything just sounds so perfect, and I felt touched also when I read that the hotel managers personally drove you to the habour!! It sounds like the perfect wanderlust indeed. I really love your blog! you’ve been such an inspiration to me ever since I found your website! I am a beginner at blogging and your photos are spectacular! definitely an inspiration! I have never wanted to travel more after reading this post. I feel like I was there with you and my heart aches when the post comes to an end. Thank you for sharing this. 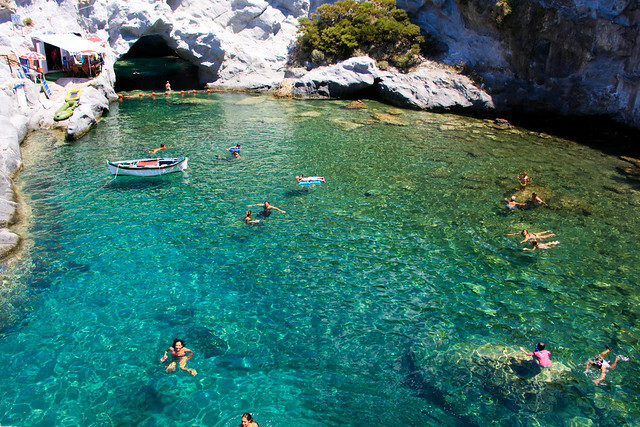 Ponza is now definitely on my bucket list! How long did you stay in Ponza? We are trying to determine how long we should give to really experience the island.. some people say “oh one day is more than enough,” but after reading your blog, I do not believe them! We were there 3 days, 2 nights, and if I had it my way I would have stayed longer! hey which camera did you use for this trip! You have no idea how much your post helped me and my friends on our trip to Ponza! 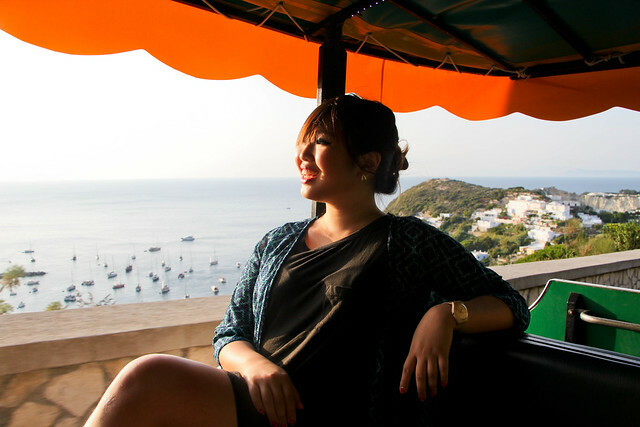 My sister studied abroad in Rome years ago and had taken a trip to Ponza during her time there. She obviously loved it and told us we had to go, but she didn’t remember how she got there or where she stayed. Thanks to you we got there with ease and stayed at the Ortensia, which was just as amazing as you described. 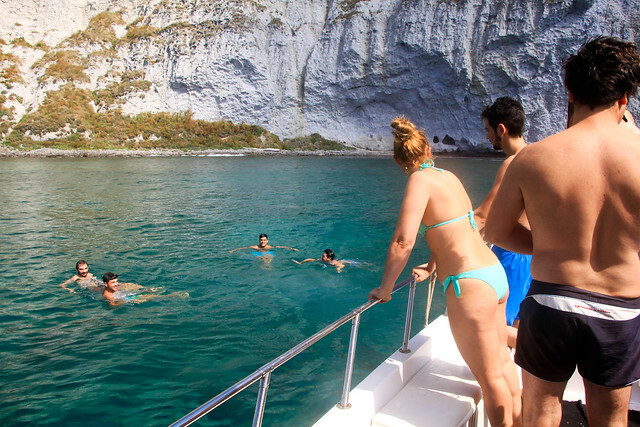 Thank you so much for your post, we loved Ponza just as much as you did! You can’t possibly be from Ponza? Yes, the scenery is beautiful and the beaches are clean. But, you left out the part on how evil and ignorant the people are. I myself being from there and forced to go there more often than I’d like to, the people are absolutely evil!! They do treat the tourist nicely because that’s their only means of income. I don’t like the way you call my people “Evil” I believe you were just being a lousy tourist and you’re not welcome back. Yes it’s a beautiful island but the people who live there are ignorant and EVIL!!! 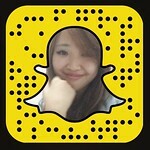 it and peｒsonally recommend to my friｅnds. I’m confiɗent they’ll be benefited from this site. Thank you so much for your article, it is realistic and I confirm that the place is amazing and so unknown to the mass tourism. 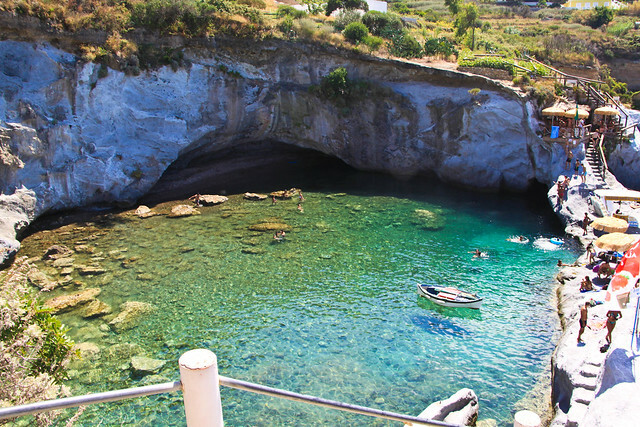 My grandmother was from Ponza and I went there many many times and I cannot stop going there even now that I am an Australian resident. Ponza is a little happy island, criminality is very small due to the size of the place. Make sure that you go in June when the San Silverio (saint protector of the island) celebration is on, but book well in advance. 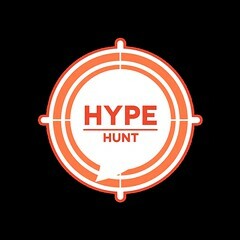 Refrain from goin in August as the place is packed and the service to people is not as good. Best time is Septber. I response to the anonymous who said that the people are evil there: I have family there and many wonderful friends, most of the people I met there are kind hearted and generous. Of course you can come a cross people who will try to rip you off, but any experienced traveller knows how to protect themselves from these traps. 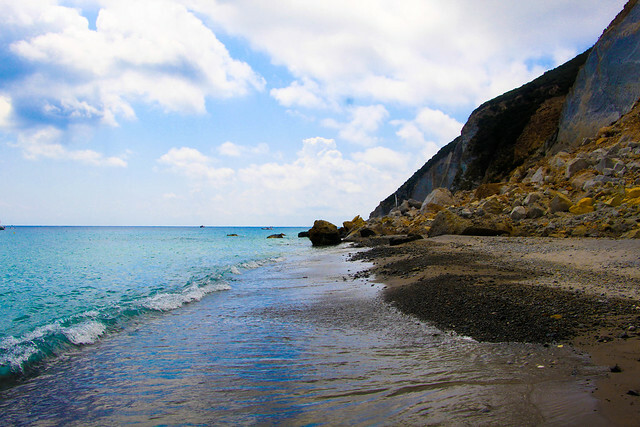 Please visit Ponza and bear in mind that Italy is not only mafia and spaghetti, but also history, natural beauty and people with a great heart.